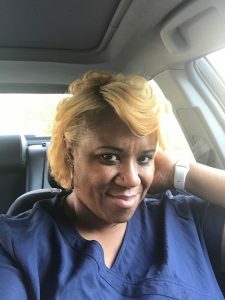 My name is Sharon and I have been a nurse more than 5 years and when I started I was challenged by the infamous quote “Nurses Eat Their Young.” Having experienced what it felt like to be eaten alive and discarded like carcass, I felt that other nurses should be better equipped to handle these situations. 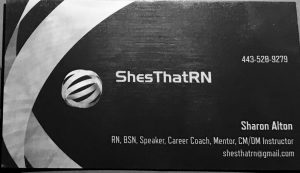 I started my mentoring/coaching business to mentor new nurses through their first year of nursing. It is important that we set new nurses up for success rather than failure and deciding to leave the career they love due to not having the proper resources and guidance. I offer mentoring and coaching to new nurses throughout their first year of nursing. 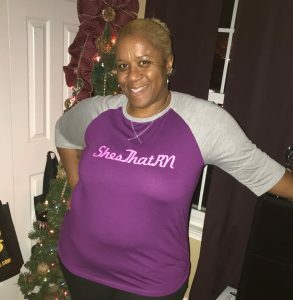 I sell a variety of “ShesThatRN” nursing gear. I help them become more confident in their abilities, teach them how to handle bullies, how to use their voices and not be intimidated by seasoned nurses or nurses with more experience. There was no one there to help me through this process and I suffered emotionally and mentally in silence. My desire to help nurses not just realize their passion, but be free to live it out loud, unapologetically and with confidence in knowing that they are a vital part of the nursing world and we need them here and to stay. I love being a nurse and couldn’t imagine doing anything else which is why I stayed instead of taking off running. I want to be a resource that helps nurses realize their full potential in the field of nursing and encourage them not to let go of their dreams for anyone.